Hundreds of years have passed since the events of The Wishsong of Shannara, and once again dark forces are at work in the Four Lands. It is up to the Ohmsford’s descendents to prevent a dark future from coming to pass. I liked this one so much more than the previous three! The story was a little less linear, the characters were more interesting, and the evil a tad less predictable. People (and by people I mean the internet) have said that the story gets better over time and I’m glad I didn’t give up on it. Most importantly, “wordlessly” and its friends were far less present in this volume. Thank you! While there is still room for improvement, it wasn’t used to the point of annoyance this time. I think that helped me out a lot. The plot is still a quest at heart, of course, but it meandered more, and had a little more to it. Seeing familiar places from the previous trilogy, only greatly changed, gave the landscape more depth. History in a novel adds so much to it. 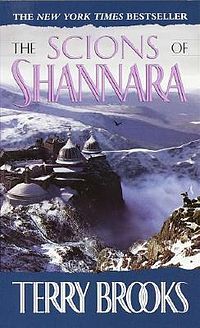 The main reason I’m so interested in this long Shannara series in the first place is because of hints to an ancient age of man, a time of science, suggesting that the fantasy world is really our future. That history is what I love so much, and having 300 years pass made it even better. The characters are far more interesting this time. I feel like they’re thinking about the quest they are about to undertake, more than just obeying orders. One character in particular objects to Allanon’s request entirely which was so refreshing! Honestly, if a druid, or wizard, or magical person of any kind showed up on my doorstep and told me that if I didn’t go on a perilous quest the world would end and it would all be my fault, I’d slam the door in his face. Sorry, but those poor Ohmsfords don’t deserve all the pressure put on them generation after generation, so when one character finally refused, I was so happy. “If the world needs saving as these dreams suggest, let Allanon or the old man go out and save it!” The way the Druids have used the Ohmsfords without telling them the whole truth and putting them in danger was finally addressed. It always bothered me how they accepted the call of the Druids so easily and I think this was just what the story needed. The big bad things this time around are the scariest yet – the Shadowen, dark parasitic creatures that creep inside of their victims and take control of their bodies. They are extremely creepy and add a feeling of real danger and wrongness to the story. I should probably start this review by discussing the plot, or perhaps the characters, but instead I’m going to focus on the one most glaring thing that I can’t possibly overlook. Wordlessly. This word is so overused it could become a drinking game. “They nodded wordlessly.” “Wordlessly they stared at each other.” Maybe I’m just being picky, but every time this word is used it seemed that it could have easily been reworded to avoid it, or just omitted altogether. They could just nod. If there’s no dialogue I’ll assume they did it wordlessly. Same goes for the staring. I just found it really distracting, and a little silly, especially when I discovered its companions soundlessly and voicelessly. I’m beginning to wonder if epic fantasy is right for me. While I enjoyed the book, and the two others before it, I didn’t love them. Something about the plot format doesn’t do it for me. Following a quest is all well and good, but it follows a very linear path that I find somewhat predictable. Travel from point A to point B, fight monsters along the way, make friends, lose friends, save the world. I prefer plots that branch out and twist and turn in ways I can’t predict. Where’s the betrayal, conflicted characters, and surprise? There was a bit of inner conflict on the part of Brin and a wee bit with Allanon, but there wasn’t enough in the story to really keep me engaged. 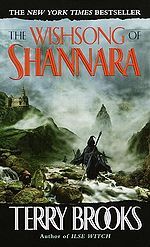 Also, the novels in this trilogy had essentially the same plot: Druid shows up, an Ohmsford or two has to save the world, epic journey ensues. Each story dealt with a different generation of the Ohmsford family, and while it is interesting to follow these generations, it adds to the predictability of things. Now that I’ve complained about everything, allow me to share what I liked about it. Let’s start with Allanon. For some reason I like him more than Gandalf. I’ve never been a fan of the whole wizard showing up at your door and disrupting your life to save the world thing, but I’d rather have Allanon do it than Gandalf. I’ve only read The Hobbit and seen the Lord of the Rings movies, so maybe I don’t know the character as well as I should, but he always rubbed me the wrong way. At least with Allanon, it seems like he feels bad about showing up like that and causing trouble. He feels a heavy sense of responsibility, especially in this book, and I feel like he cares. As for the other characters, Slanter and Garet Jax were great. Slanter for his personality and Garet Jax because he is essentially a ninja and ninjas are awesome. The bond between Brin and Rone Leah wasn’t particularly convincing though. I was a little disappointed there.